Let no nation in western world forget that it is still the Biafra in West Africa which its declaration in 1967 sparked out a genocidal war waged against us by Nigeria government and her then global military allies that is still under contention. Till today, we, the younger generation of Biafrans continued suffering the humiliations, killings, massacre, political and economic marginalisation, nepotism, religious extremism and all forms of dehumanising treatment which led our fathers to declare the sovereignty of Biafra in the first in 1967. 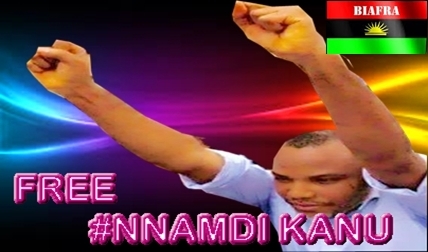 Presently, to prove my point, Mazi Nnamdi Kanu (Prisoner of Conscience) and thousands of Biafrans are illegally detained in various prisons in Nigeria even against court verdicts ordering their unconditional release, due to our unshakable resolve to restore Biafra where our descendants can have hope of maximizing their potentials and contributing their quota in developing the world. Western world nations like United States, Russia, Germany, Britain, Canada, Portugal, France, Israel, Spain and many others are now under moral obligation to queue behind Italy in compelling Nigeria government to respect the right of Indigenous People of Biafra to Self-determination as declared by United Nations in 2007. I want these nations mentioned above to tell me if they are using barrels of gun and bullets to force unity on their citizens against their wish to go their separate ways. It is time for these world powers to reject the financial inducement of Nigeria government in lobbying them against Biafra. United Nations under Antonio Guterres as the Secretary-General should also sit up and compel Nigeria to respect UN charter which they are also signatory to by allowing Biafra secede peaceful as time may reach when we may no longer endure oppressions in Nigeria. Let me use this opportunity to put record straight, Biafrans are not calling for disintegration or division of Nigeria but carving out of Biafra territory from the federation of Nigeria is our demand.